Once you have begun learning beginner’s French, it is quite easy to stop there and tell yourself you are fine with what you have learned. The point here is to keep going despite the obstacles. To help you do just that, I have made it easy for you to continue learning French through the resources I provide. 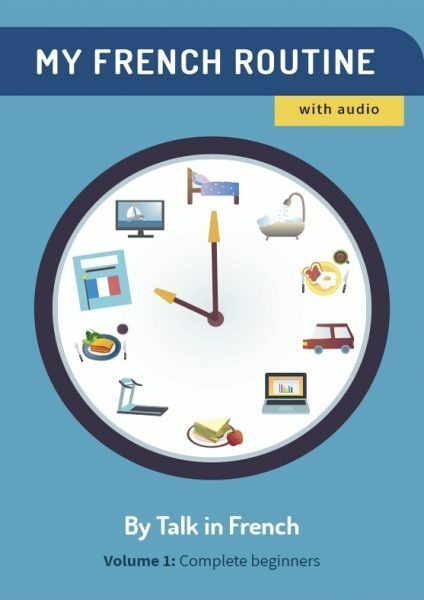 This week, I am quite happy to introduce to you the third volume of the series “My French Routine.” Whether you have already bought a copy of the first and second volumes, or you have studied beginner or intermediate French before and need to continue with your studies, this is an e-book for you. Grammar is not really a fun topic to learn, but without it, you cannot build the proper foundation for learning French. So, guess what? We will flip those anti-grammar frowns upside down! 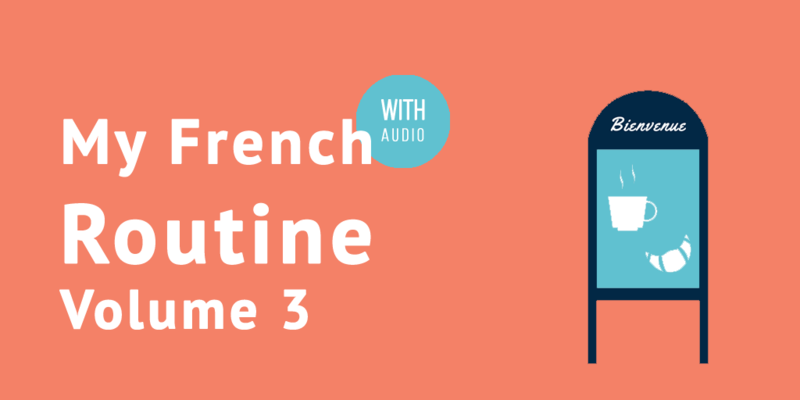 “My French Routine” carefully combines grammar and vocabulary lessons, auditory examples you can listen to, and lots of exercises. The result is a totally exciting month of French lessons. 1. It helps you build a daily learning habit by providing you with short but challenging daily lessons for a month. You will receive one lesson per day, five days a week for four weeks, with weekly lesson recaps during weekends. 2. It trains you to listen to spoken French. Each lesson comes with French conversations recorded by native speakers for you to follow along with to practice your pronunciation. Listening is a key skill every learner must master before becoming fluent in French conversation. This e-book provides lessons with a strong focus on listening to train you early on. 3. It gives you exactly what you need to learn French. The book is based on an effective learning method that combines grammar lessons with exercises for maximum understanding. The daily lessons are composed of a good mix of grammar and vocabulary topics, audio guides, and learning exercises. How Will You Know If This Book Is for You? This book is for you if you are a beginner to intermediate learner who already has previous knowledge of basic French grammar topics. With this book, you will be able to move further along in your lessons. It is also a great resource for those who have studied French previously but want to get back on track. Finally, it is great for learners who prefer learning French on their own and are looking for a complete step-by-step method. If you are not sure which level you are, or whether you should be buying this volume or the two previous volumes, send me an email at contact@talkinfrench. I will provide a quick assessment via email to determine the right book for your level. THE MASSIVE launch discount you can get today, until the 15th February 2016 only! 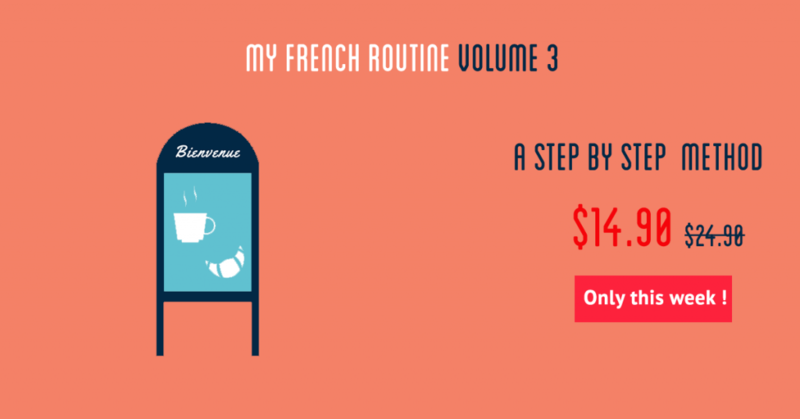 When you purchase a copy of “My French Routine Volume 3” within this period, you will receive the e-book, complete with the audio package, for a staggering US$ 10 off, or the equivalent currency. There will never be another offer like this in the near future, so get your copy on sale today! If you would like more details about this volume, please click the photo below. Merci!